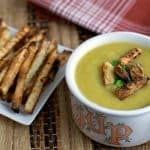 With fall officially underway, what could be more comforting than a nice hot bowl of Potato Leek Soup? Here’s a tip – add a few french fries as a garnish…talk about GOOD! Add chopped leeks to a bowl of cold water and rinse thoroughly. Drain leeks and add to a large soup pot. Add just enough water or veg broth to prevent sticking, and saute the leeks until they are very soft. About 10-15 minutes. Add 1 clove of minced garlic and stir. Meanwhile, peel and cut the potatoes into equal sized cubes and add to the soup pot. Reduce heat and cover. Let simmer until potatoes are very soft – about 15-20 minutes. Remove from heat and blend using your blender or immersion blender. If too thick simply add a little more broth or water. Garnish with fresh chives, parsley, crispy french fries, or vegan sour cream.